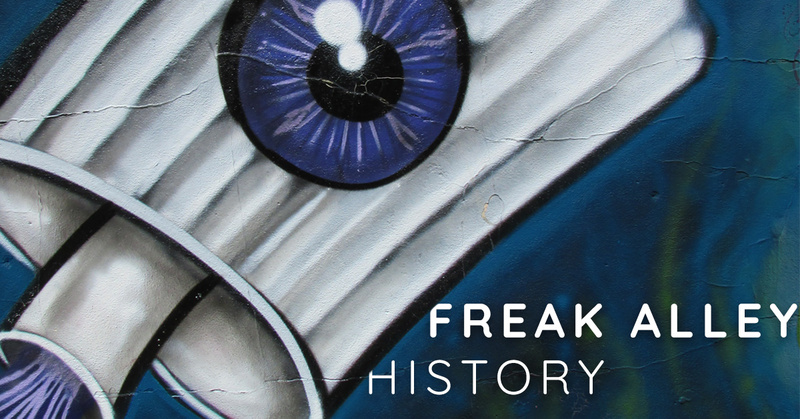 The Freak Alley Gallery is touted as the oldest Outdoor Mural Gallery in the Northwest and began with the stroke of the paintbrush by its founder, Colby Akers on December 15, 2002. As legend has it, Colby was painting some art on the access doorway of Moon's Kitchen. When he was asked to sign his work by an employee, Colby instead asked permission to continue his artwork. Other businesses then asked Colby to extend his work beyond the first doorway and a Boise institution was born. Colby estimates that 300-400 artists or more have participated in the Freak Alley Gallery in fifteen years by displaying their art at the gallery. The age of the artists ranges from 7 to 35 years old. Since 2011 the Freak Alley Gallery has held an Annual Mural Event the 1st Saturday of August through the 2nd Saturday of August. This year's event will be held August 4th through the 11th. Art is also updated in the Spring and Fall and submissions to the gallery are accepted year round. According to Colby, the city of Boise has no control of Freak Alley Gallery,”We are not a part of the Cities Public Art Department nor governed by them. We are a 501(c) 3 non-profit organization. The F.A.G. is committed to being inclusive not exclusive. We primarily work with the property management and owner of Bannock Block 44 and of course the Great Artists of Boise and from all over the country that help to create this Outdoor Mural Gallery.” Colby continues that he would not want to leave out the wonderful businesses on the block which include Portsche's Jewelry, City Peanut Shop, Matador and Juniper restaurants just to name a few. "Where there's potatoes, there's hops"
Scary, Fun, and Family-Friendly Halloween Events for October 2018!